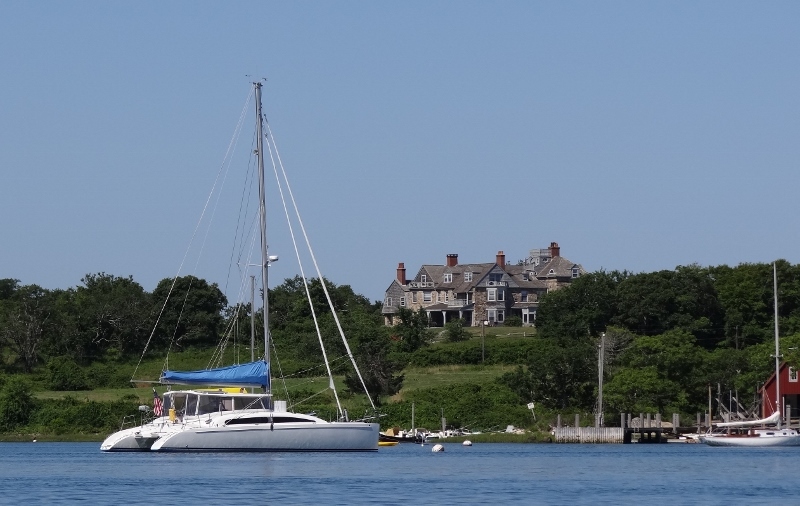 After two nights in Oak Bluffs we once again found ourselves motoring; this time nine miles to Hadley Harbor at the top of the Elizabeth Island chain. 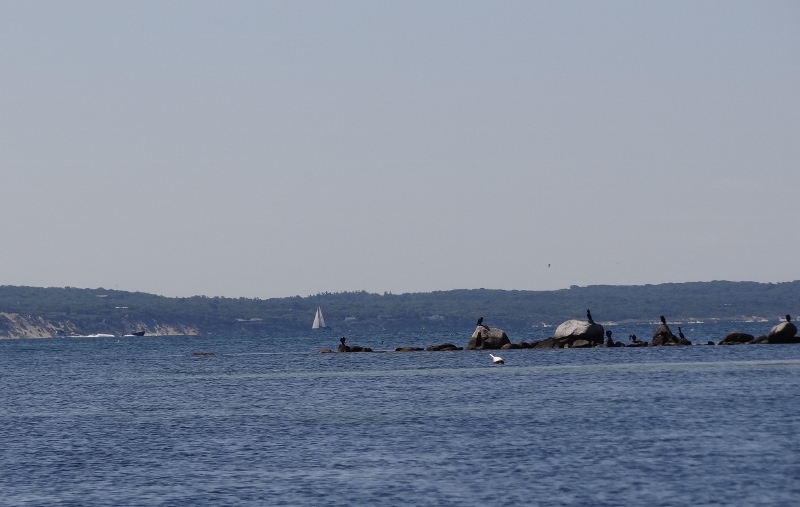 Last summer we’d gotten a tip from a local boater who told of free moorings in this lovely, super-protected inner harbor, much like Hamburg Cove only smaller. 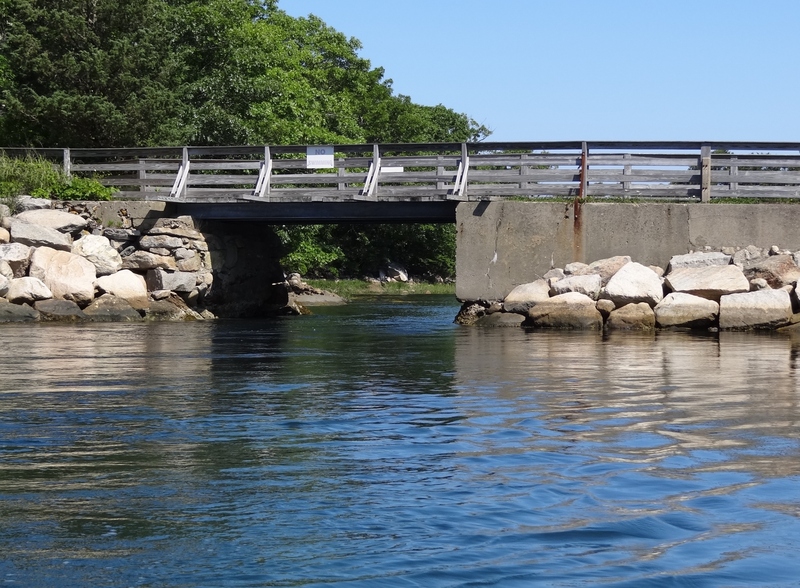 This would be the perfect stop on our meander up Buzzard’s Bay as we approached the eastern entrance to the Cape Cod Canal, (CCC). Our 2pm departure was chosen so that we’d have a favorable current as well as not too much of it through the challenging Woods Hole Passage. It’s an irregular S-shaped passage with Buzzards Bay at the NW end and Vineyard Sound at the SE end. Rocks, shoals, tiny islands and ledges lie in wait for your wrong move since the tidal currents don’t run in the direction of navigation. A week ago we heard a sailor radio SeaTow; he was stuck on a rock ledge in the passage. No doubt he was sailing and the current won out over the wind. We studied the chart so much I thought for sure an imprint would remain. When the time came we had no problems mon just a bit unnerving to see more rocks and tight buoys than we are used to. 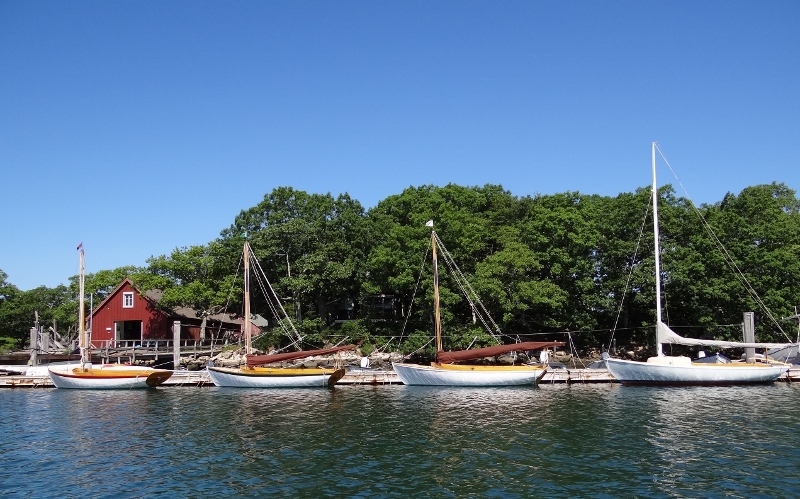 With sincere apologies to Hamburg Cove, I rate near-perfect Hadley Harbor as a 5-star peaceful, enchanting, must-visit harbor. 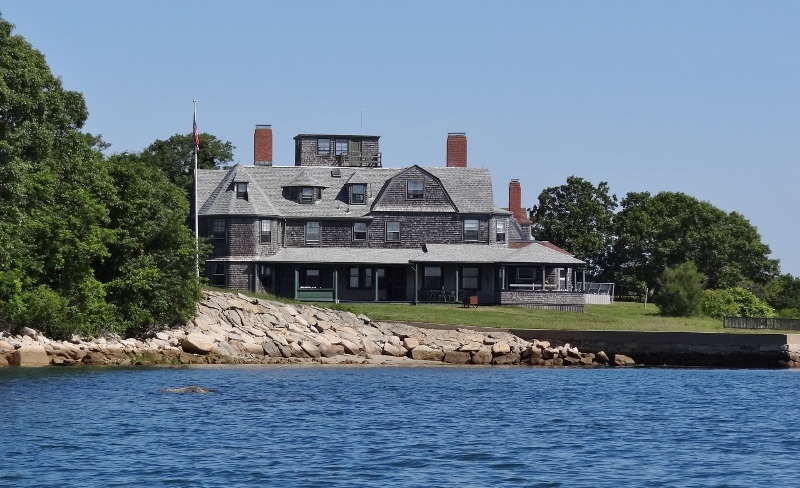 All of the Elizabeth Islands, except for Cuttyhunk and nearby Penikese, are held in trust by the Forbes family; an old Boston family and no direct relationship to Malcolm Forbes. You probably have heard of this Forbes family member: John F (for Forbes) Kerry. I wonder if he was named John so that his initials could be JFK? The Forbes attempt to keep the islands (Naushon, Nashawena, Pasque, Uncatena and Nonamesset are the larger ones) as close to their natural state as possible. 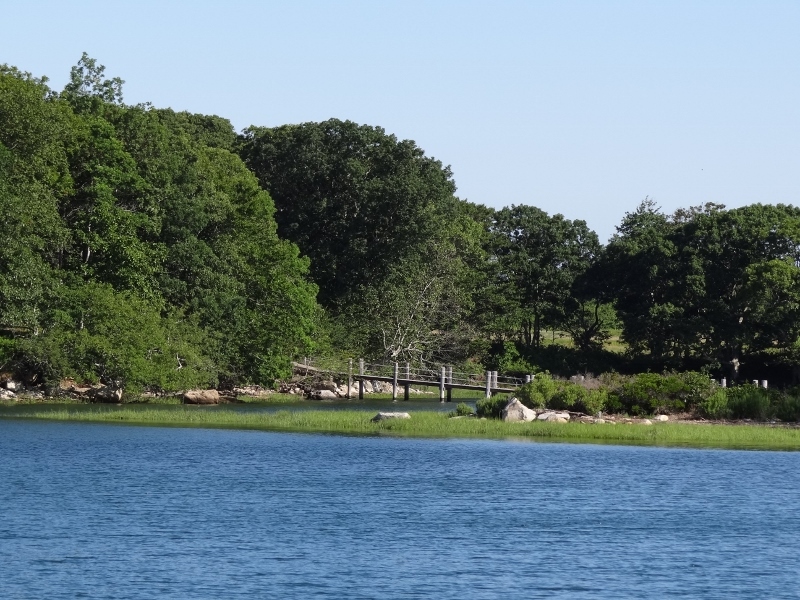 Around Hadley harbor the only place to step ashore is Bull Island. 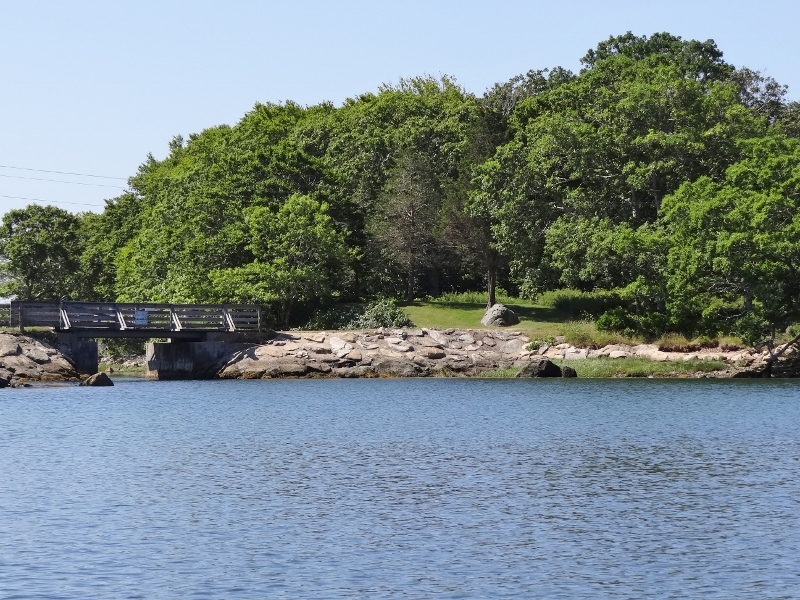 With a dinghy dock and picnic area it also serves as a place to walk your dog. The 20 or so moorings are well-spaced and compliments of the Forbes. This works out well for everyone. The bottom is covered with long eel grass which makes for lousy holding and no one wants a boat to drag into another especially if it happens to be a Forbes owned Herreshoff. Boat house and could these be Herreshoffs? 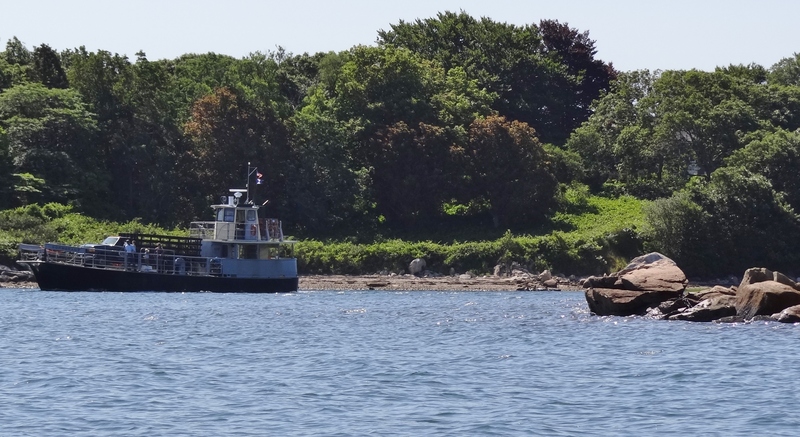 The m/v Cormorant makes several round trips daily and needs a clear fairway. Boats can anchor off to the side and between where we were (closer to the entrance) and the narrow entrance. The ferry carts trash off the islands, brings supplies such as food and building materials, etc and transports guests and the multitude of family to and fro. 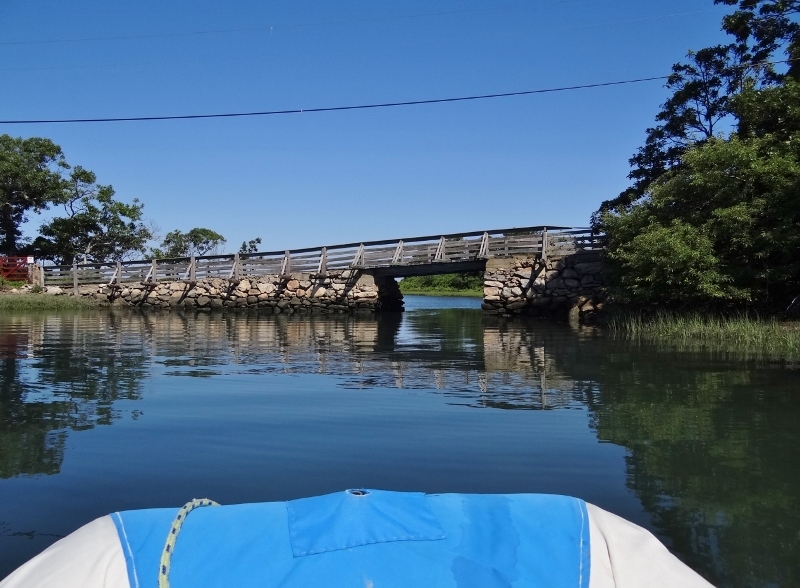 An around the islands tour takes you through several gutters which are narrow passages under wooden bridges between some of the islands surrounding Hadley Harbor. When the current is running full force the water rushes through these narrow openings like water shwooshing down a gutter. Don’t laugh, these are labeled Northwest Gutter, etc on the chart. 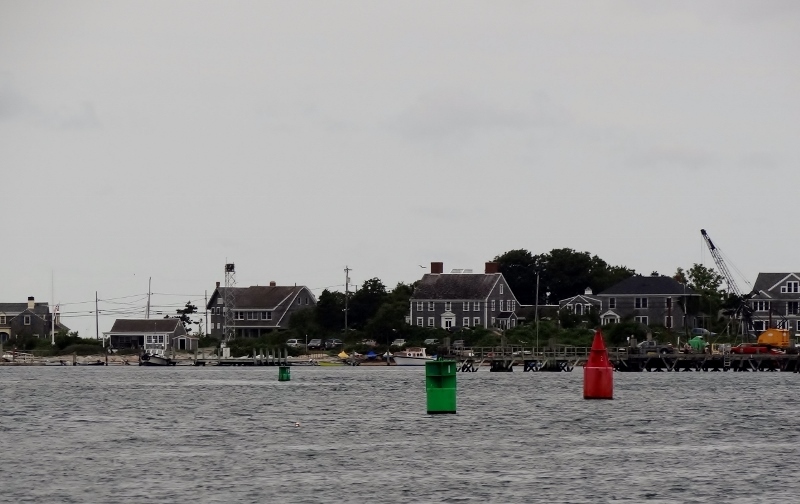 I could have stayed much longer but we wanted to stop at Quisset and take the trolley into Woods Hole before jumping up to Red Brook Harbor for the nasty wind and stormy weather due in Sunday.